New Yorkers can be forgiven if they believed homelessness was a problem consigned to the past. Tent cities that in the 1970s and ’80s crowded city parks are gone—mostly—and television exposés no longer shock the public with depictions of subhuman conditions at the city’s infamous homeless hotels. The Rev. Michael Callaghan is the executive director of Nazareth Housing, a housing assistance and homelessness prevention service that has long been at work on the crisis. Today’s homeless people, he says, are often hidden from view—women with children escaping abusive relationships or living doubled, tripled, even quadrupled up with family or friends or sheltering in building basements or other improvised places that were never intended for human habitation. 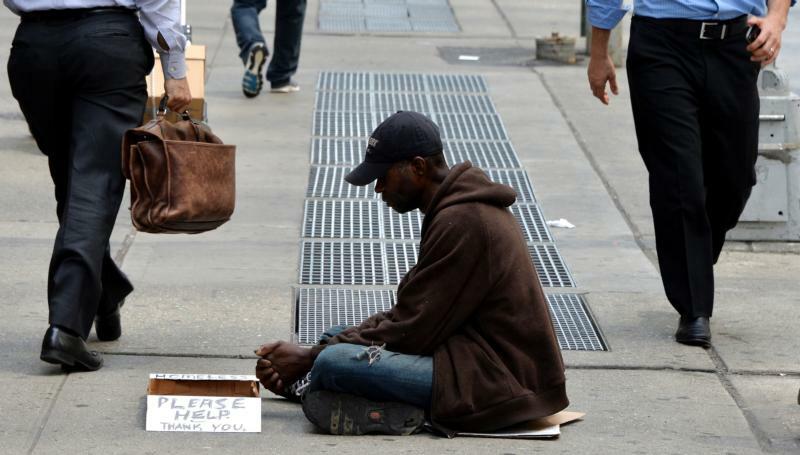 For him, the cause and effect of New York’s homeless problem is not hard to discern. “The overarching problem is poverty,” Father Callaghan says. The big city may have a reputation as a glittery play-land for the wealthy, but for most New Yorkers it is simple a gritty place to call home. That is becoming harder to do all the time. A study conducted by the Coalition for the Homeless reports that while median rents in low-income neighborhoods shot up 26 percent between 2010 and 2014, real median household income in those communities fell 7 percent. Where those data points cross, people are losing their homes. “The city population has grown, and economic disparities have exploded,” Father Callaghan says. With working class incomes stagnant or diminishing, even so-called affordable housing units set aside by developers are not truly affordable to working families. Emergency shelters, he says, have just become the “new normal,” part of “how people plan to find housing in New York; it’s no longer a safety net. It has become a pattern for multiple generations of people in New York. ‘I’ll just go to the shelter.'" As Nazareth Housing’s director for Outreach, Prevention and Supportive Housing, Mildred Perez works with people fresh to homelessness or on the verge of it. Plenty still lose their homes because of classic dilemmas like an unexpected medical crisis, the loss of a job or death of a spouse. But given how close to the bone many New Yorkers are forced to live, Ms. Perez has seen families topple into homelessness after paying for a child’s birthday party or Christmas shopping, even a weekly supermarket visit—expenses taken for granted by families not as stressed by high housing costs. One of the people she worked with was Natalie Rizzo. Within a two-year span as the Great Recession gripped New York and the rest of the nation, Ms. Rizzo lost her marriage, her job and finally her home. By 2009 she had been struggling for a year to raise her young son solo, her only income a $400 weekly unemployment check. Two of those checks a month were not enough to cover her rent, but because of them she did not qualify for any other social assistance. She eventually stopped paying rent as survival expenses like food were prioritized. She decided she had to abandon her apartment, but she did not want to abandon her life in New York to double up with relatives in Florida, nor did she want to be a burden on other family members in the city. Ms. Rizzo sold her furniture and anything else she could from her apartment and prepared to enter the city’s shelter network. “That was my lowest point,” she remembered, “sleeping on the floor of my apartment that night,” knowing the next morning she would be officially among the city’s homeless. Fortunately for Ms. Rizzo, she quickly connected with Nazareth Housing. Taking full advantage of the various programs facilitated through Nazareth, she finds herself a few years late, not only in an affordable one-bedroom apartment with her now teenage son, but a graduate of City College and working on her master’s degree. She plans to become a special education teacher. Grateful for all the help she has received, Ms. Rizzo stands out as one of those heartwarming, homeless turnaround stories loved by the media, but she remains painfully aware of how tenuous her current standing is in a high-rent city like New York. These days, “I don’t take anything for granted,” Ms. Rizzo says. She’s content to live in her Lower East Side one-bedroom, but would like to someday to move into a two-bedroom that would better suit her family’s needs. That’s the hope anyway. For now she knows, that is still a dream she cannot afford. Successive mayoral administrations have struggled with how to best create affordable housing in New York as real estate developers fixated on building luxury units that draw overseas speculators who contribute to even deeper N.Y. market distortions. That is part of the reason Father Callaghan does not believe the private sector alone can be depended on to sufficiently to respond to the need. Editor’s Note:A different version of this article appears in the Dec. 19-26 issue of America. There is apparently no great concern for the homeless among the comfortable. My archdiocesan newspaper published my letter, in response to Pope Francis’ plea for the settlement of Syrian refugees, suggesting that every parish in the nation – about 17,000 of them – could probably afford the resources to find homes for one refugee family. On the paper’s website I later found a chastising “ad hominem” reply to my suggestion. Nor have I heard of any efforts at such from United States’ Bishops. If we don’t want to do it for the refugees, then perhaps we would consider doing it for our own citizen homeless? It is pretty clear that no one cares about homeless people. When they become visible, police and others destroy their temporary living quarters and make them move on. On to where? Mostly out of sight and away from here. Every city is afraid of becoming a "magnet" for homeless by offering services to them. So the only help they receive on any consistent basis is from the trickle of private donors and starving non-profits who actually do seem to care. Shame on us all. This article also appeared in print, under the headline "Record Homelessness Hits a High Rent City," in the December 19-26, 2016 issue.